EOGB Energy Products ltd / EOGB Blog / Happy Birthday to EOGB! Few people know that EOGB actually started out as ‘Electro Oil & Gas Burners Ltd’, a subsidiary company of Swedish burner manufacturer Bentone. 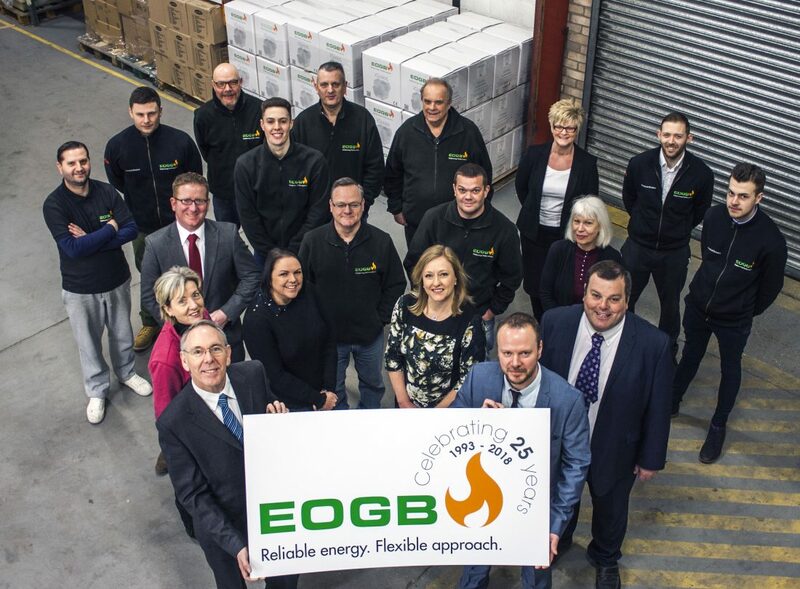 However, in 1993 it went through a management buy-out, was rebranded to ‘EOGB Energy Products Ltd’ and relocated to St Neots in Cambridgeshire (where we still operate from today). In the early days EOGB acted as an agent for the Bentone range of burners, providing technical support and spares for UK customers. A few years later, EOGB engineers developed low voltage (12v and 24v) versions of the Bentone sterling oil burners. These burners were an industry ‘first’ and provided heating solutions for very specialist applications such as field kitchens or road marking equipment. In the same year EOGB and Bentone parted ways and EOGB became the sole UK agent for Italian burner manufacturer Baltur, a relationship that is still going strong some 18 years later. EOGB went on to design and manufacture its own X Series range of domestic oil burners which was launched in 2004. The three XSeries burners (X400, X500 and X600) have grown in popularity over the years and have become the product of choice for many heating engineers due to their easy installation, reliability and superior performance. In 2008, EOGB began running annual training courses at the Baltur research and development facility in Bologna, Italy. Due to the popularity of this training scheme, we went on to build a purpose-built training facility in 2010. We now offer a wide range of training courses including OFTEC oil, ACS gas, burner training and LPG. To provide heating engineers with useful tools in an increasingly digital world, EOGB launched the oil nozzle calculator app. The app is able to work offline and calculates burner and boiler outputs in kW based on pump pressure, nozzle size and boiler efficiency inputs. It is suitable for all makes of pressure jet burners that use Danfoss nozzles and covers kerosene (Class C2) and gas oil (Class D) to BS2869..
With an impressive history, wealth of industry knowledge and many achievements under our belt already, the future is looking bright for EOGB. In particular, we are very excited to launch the eagerly anticipated ‘Sapphire’ blue flame burner this year. The revolutionary burner is the first of its kind in the industry and not only satisfies both 2018 and projected 2022 ErP Directive legislation but also improves boiler performance, reduces carbon emissions and incorporates innovative OpenTherm technology. For more information of EOGB’s Sapphire burner, click here.